In this Talk from December 23, 1973, entitled “Guru As Prophet”, Avatar Adi Da distinguishes between the Spiritual Function and the “prophet” function of the True Guru. As prophet, the Guru offends, criticizes, and undermines the usual ego-based life by confounding the search and the need for consolation and fascination. This process works to bring about a crisis of understanding in anyone not yet involved in the real Spiritual process. Listen to an audio excerpt from the first section of the CD. The Spiritual process, the life-process, is utterly dependent on the Divine Itself. And no exploitation of life or Spirituality Itself Realizes the Divine, but is, in fact, motivated by a prior sense of separation, dilemma, absence of Divinity. And so, only the crisis in which that whole possibility of seeking and being fulfilled and ultimately finding God—only the crisis, which undermines that whole affair—truly serves even the Spiritual process. Adi Da explains that teachings about ordinary life or even about Spiritual life tend to console the seeker in some way, exploiting the search for self-fulfillment. But contact with the True Guru frustrates the seeker instead, and draws the individual into the feeling of dilemma that is at the root of his or her search. This serves the crisis that must precede the real Spiritual process whereby the True Guru's Spiritual Function may be discovered. The Guru’s Spiritual Function is essentially hidden until the prior condition of real intelligence, or understanding, has been fulfilled. Then the Guru may reveal himself or herself as Spiritual Master for the devotee. 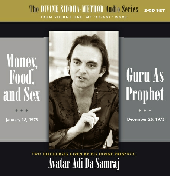 Later in the Discourse, Avatar Adi Da returns to the primary theme of the Guru-devotee relationship. When the ego-frustrating process is engaged as Satsang, or relationship to the Guru, then present Realization of the Divine can be Awakened by Grace, and the real Spiritual process can begin.